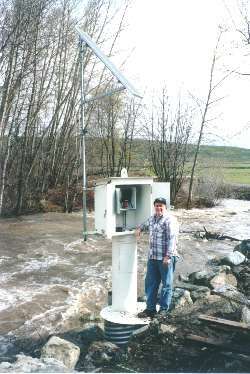 Jack Carpenter, then KRDs Water Master, and Bob Johnson, an engineer specializing in radio and instrumentation, began searching for a solution to this challenge. Both gentlemen knew that a solution to this particular application would be applicable to the future needs of KRD. The prototype system was designed, installed and tested. The system, even in its rudimentary form demonstrated the practicality, success, and usefulness of remote interrogation. This first system was solar powered, radio linked, and manually operated by common place computer software. These three components allowed KRD to avoid recurring telephone costs, avoid power utility costs, save many man-hours daily (driving) and provided better ongoing and immediate knowledge about the operation of the districts North Branch Canal. Soon thereafter, the system was expanded to interrogate other locations where the operational benefits and man-hour cost savings would benefit KRDs customers/landowners. The system was upgraded to a newer electronics design and custom software was developed to allow faster and less cumbersome interrogations of the now multiple remote sites. Several strategically located interrogation points were added to provide water masters with better and more immediate flow information. Remote manual control over the districts most critical gate, the South Branch Headworks was installed. 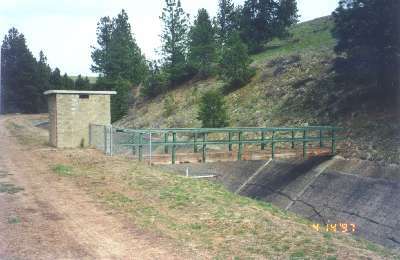 Automatic gate control, remote bay level interrogation, and remote stem position reading at the Wipple Pumping Plants two "bays" to allow an accurate measurement of the water being returned to the Yakima River. Few changes were made to the system in 1995 and 1996. Some software enhancement were done to make its use more convenient for the water master, additional work with gate automaton was done at the Wipple Plant, and radios were reprogrammed to allow the interrogations to operate through the Districts voice radio repeater in a marginally successful attempt to improve coverage. A new radio transmitter site was constructed on KRD right of way near Passmore Rd. above the town of Thorp. This included a 40 heavy duty tower and an equipment building. A new "data only" repeater was installed at the Passmore radio site. This repeater resolved coverage issues, improved performance and allowed for the interrogation frequency to be increased, a requirement for the Fisheries. One new interrogation point was added at the Yakima/Taneum confluence. 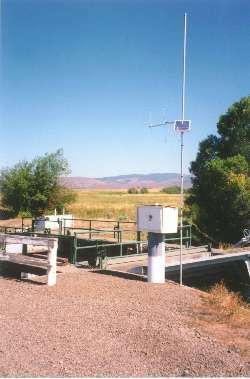 Water temperature measurements were added at 3 strategic locations and Air temperature measurement was added near the Taneum Creek/Chute confluence. Software was significantly rewritten to allow for automatic timed interrogation, daily morning printouts for the watermaster and archive data storage of the information received. Level "out of tolerance" alarms printed and sent to alpha pagers. Graphical Representation of water level versus location. Computerized spreadsheet manipulation of the recorded data. Today, the system is still under development. Changes in technology, BOR requirements, Fisheries needs, and landowners demands will continue to drive the future enhancements to the system in response to the demands placed on our critical natural resource, water. The system consists of four major components. At the heart of the system is a Pentium computer running a customized software program call "Levels" specifically designed to operate in the KRD environment. The interface between the computer and the outside world is done through the use of two modems; a telephone modem and a radio modem. Requests for data are transmitted from the KRD office through a UHF control link to a "cross-band bi-directional" repeater located at the radio site off of Passmore Road. The repeater sends the request on to the individual "Point" units. The point units reply back to the office through the same path. Similar information is gathered through the telephone modems. Thus, the components are: the computer, the modems, the repeater, and the point units. The "Levels" custom software controls the entire process. The program contains a database of information that describes each of the point units (name, type, expected data, radio, telephone, etc.) and the daily times that each point unit is to be interrogated. The program itself then knows based on the description of the point unit what to do to contact each point unit and when to do it. The program also archives the point units responses for later reduction of the data obtained. In a few of the cases the Levels software will access the telephone modem and dial a number which has a similar modem connected to a "Stevens" datalogger on the other end. This enables the computer to interrogate this kind of point unit which is common in many other less advanced systems. Most of the point units are however radio linked. This is done through the repeater which is in reality transparent to the process. In this case the computer accesses its radio modem and hails a particular point unit by sending out its "name" in a data string. Only the hailed unit will respond since its name is unique unto itself. Once the hailed unit has answered it is connected to the computer through the radio modem. Then, the computer, relying on some intricate timing, interrogates the particular point unit and waits for a response to be received. Following the response period, the computer releases the connection to the particular point unit. If more point units are to be interrogated the process is repeated using the next name, and so on. Then following the response period the computer examines the received data and, if it is of the correct and anticipated response, it stores it in the archive and makes it available on the screen for viewing and printing.